Backtrace has added native support for PLCrashReporter library. Engineers who use this popular crash reporting library on iOS and macOS can now submit errors directly to Backtrace. This enables simple integration from Swift and Objective-C based applications, and eases migration from other platforms like HockeyApp. With this release, Backtrace expands the options available for crash reporting from macOS (beyond the Crashpad and Breakpad libraries), and now provides coverage for mobile and tablet applications with iOS support. Backtrace now supports crash and error reporting across all major client, server and mobile platforms, and whether your organization has teams working on Windows, Mac, Linux, iOS, or Android applications, they can all triage and diagnose issues from the same Backtrace system. Check out our documentation for more information. Critical to the Backtrace user experience is the seamless integration with existing systems for ticket tracking, messaging, and more to support resolution workflows. Backtrace engineers work to eliminate variables that require human intervention. With the June product update, Backtrace has added new support for custom fields in Jira. This gives teams more flexibility to identify and provide information based on the needs of the organization. The new integration populates a wide range of fields automatically to ensure bugs have enough relevant information and are assigned properly. Configuring custom JIRA field values in Backtrace. 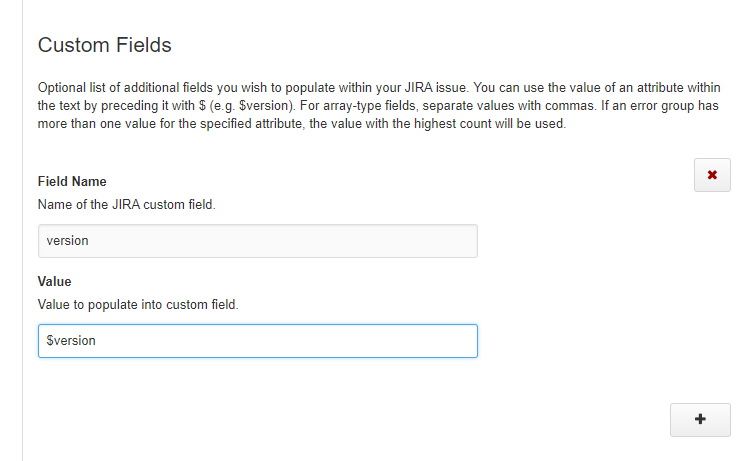 The Custom Fields setting is an optional list of additional fields you wish to populate within your JIRA issue. You can use the value of an attribute within the text by preceding it with $ (e.g. $version), or specify a static field, like type=ProductionCrash. For array-type fields (such as labels), values are separated by commas. In case you missed it, Backtrace added support for C# with the Backtrace C# crash and exception reporting library. It is supported on various runtimes and operating systems, including .NET Standard (Xamarin, .NET Core 2.0, UWP), .NET Framework 4.5, 4.6, Unity (Mono) and .NET 3.5. We discovered that many C# teams use multiple systems to do crash and exception reporting across their stack, and a look into Backtrace reveals some important differences. Read the blog 5 Ways to Improve Your C# Exception Reporting to learn what you could be doing better. For those of you using Backtrace’s ptrace utility, this includes ATS and coresnap users, we’ve added a mechanism to extract data from core dumps on systems other than the host system where the core dump occurred. This functionality can be used to generate Backtrace snapshots (.btt files) from core dumps for submission into your Backtrace instance or to extract valuable insights from core dumps through our analysis modules on any system. We’ve exposed this functionality through the –map-path-fallback option. Users of GDB who are familiar with set sysroot will feel right at home with this Backtrace capability. The –map-path-fallback option allows the engineer to tell ptrace where to look for the target libraries that contain the required symbol files needed to generate human readable callstacks. This shaves off minutes or even hours it would otherwise take to locate and configure the right information to begin debugging. Backtrace also employs additional heuristics to complement the information directly from the callstack and expand what the compiler originally produced when the application was developed. With this update, heuristics now apply more advanced information for child and inline frames. New help.backtrace.io is now live!